Notice first that to take responsibility for a state of affairs is not to claim responsibility for having caused it. So, for example, if I take responsibility for cleaning up the kitchen I am not thereby admitting to any role in creating the mess; the state of the kitchen may be the consequence of actions quite independent of me. Similarly, in taking responsibility for her sexuality, a woman is not thereby claiming responsibility for what her sexuality has been, but only for what it is now and in the future. 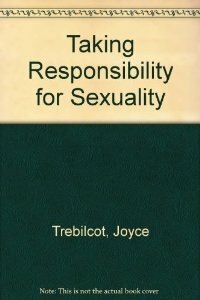 This entry was posted in Uncategorized and tagged feminist analysis, good advice if you can get it, Joyce Trebilcot, sexuality by thisfrenzy. Bookmark the permalink.